I really like how things are going this year at the school my children go to. Their school is a candidate school for an international charter school program, and it’s really going well. Most of the curriculum is what you’d expect from a public school, as the charter school is owned by the district, but it’s the little extras that make it so nice. I particularly like that the inevitable fundraising has been environmentally aware. Recycling is a part of it for my son’s class. It’s pretty simple. They’re collecting soda cans and plastic bottles for recycling. Once a week we’re allowed to bring them in. I don’t bring in much. We don’t drink much soda. However, I have a relative who does, and while I don’t see her much, I’ve asked that she put her cans aside for when I do visit or if she comes to see me. Every once in a while, the school should be getting a good sized donation of recyclables from us that way. The teacher also wants magazines for class projects. It’s a first grade class, so she has requested that magazines have appropriate content and that ads for things such as adult drinks be removed. Even the classic fundraiser they did recently was with an environmentally friendly company. I like how they’re thinking these things out. We probably didn’t sell as much as we would have with a cookie dough or wrapping paper fundraiser, but I like to think that it was less wasteful. I’m really anxious for the fundraiser for my daughter’s class to start, and I really don’t know why it hasn’t started yet. Theirs isn’t to be quite so obviously environmental, but selling grocery store scrip is a pretty good idea. You spend what you’d spend anyhow, and the school gets money. It seems like a good idea to me. If you’re involved in fundraising efforts for your child’s school, I urge you to consider the environment when you do so. Recycling certain materials can make some good money for your school while teaching the kids the value of recycling, and there are more environmentally friendly products out there to sell to family and friends than the usual stuff. Published by Stephanie, in Eco Friendly Parenting. 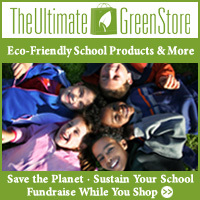 Tagged with charter school, eco friendly fundraisers, school fundraisers.